Because of this, we need to keep it clutter free, clean and tidy. I couldn't find a "between" photo, but the photo below is what we started with. It was cute, but way too dark. When we first moved in, we painted the blue wall a white called Cotton Fluff to lighten things up, but we left the beadboard unpainted for several years. Our 12-year old dryer finally died for good (after having it repaired 3 times in the last 5 years). 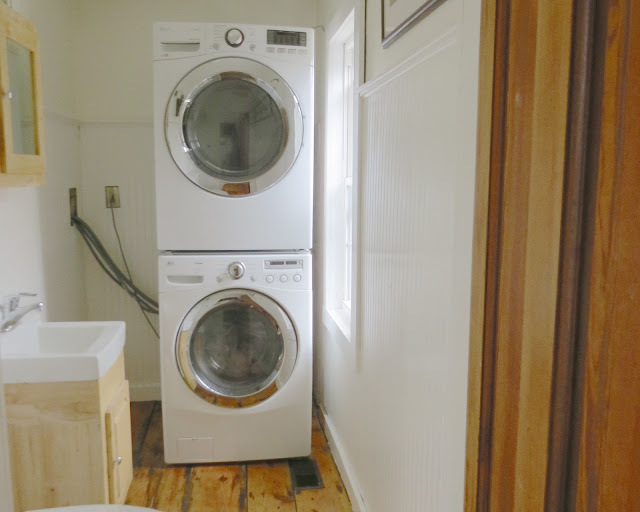 Of course, replacing the dryer meant it was a good time to paint the beadboard. The color is my go-to color - Simply White. We used Behr paint in semi-gloss because it needs to be really washable in here. 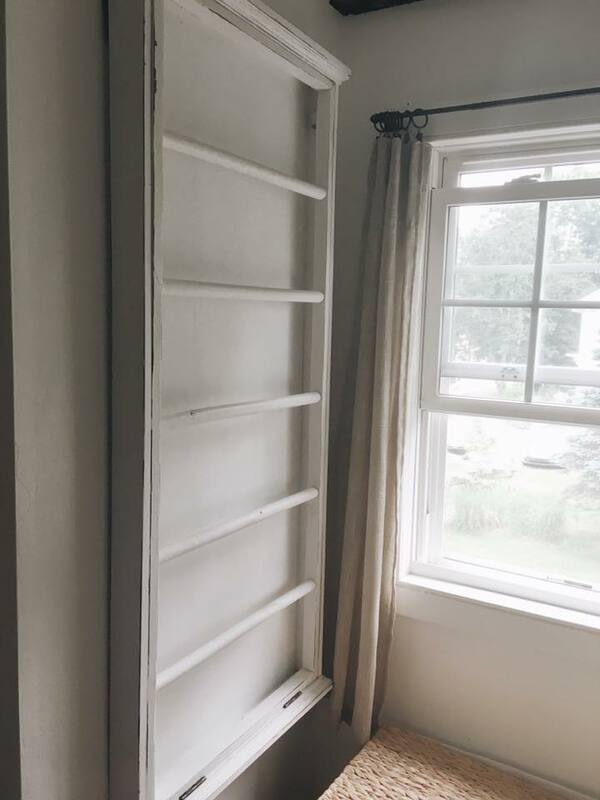 We had also painted this wood shelf which needed a touch up. 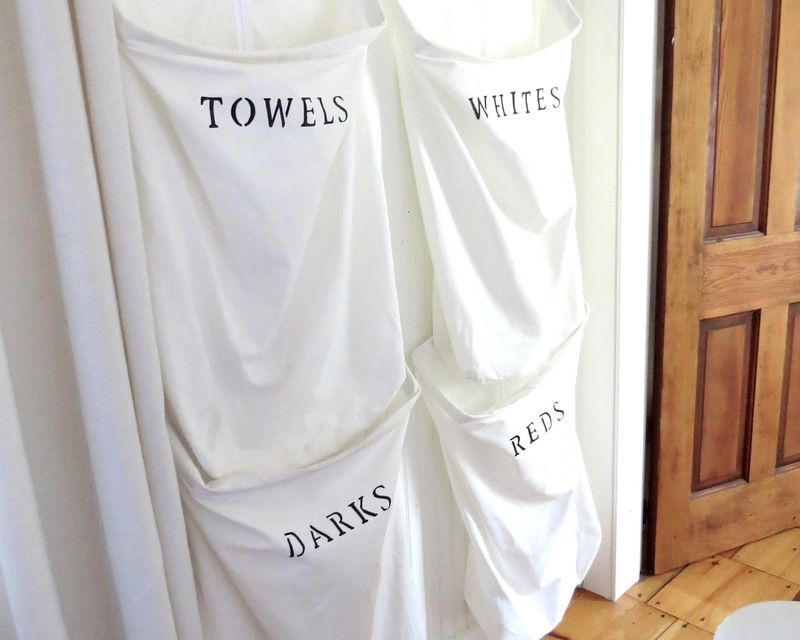 This is great to hold extra towels and laundry supplies. There are no other closets or shelves in here, so this serves many purposes. One thing I am really good at is NEVER leaving unfolded laundry in a basket. 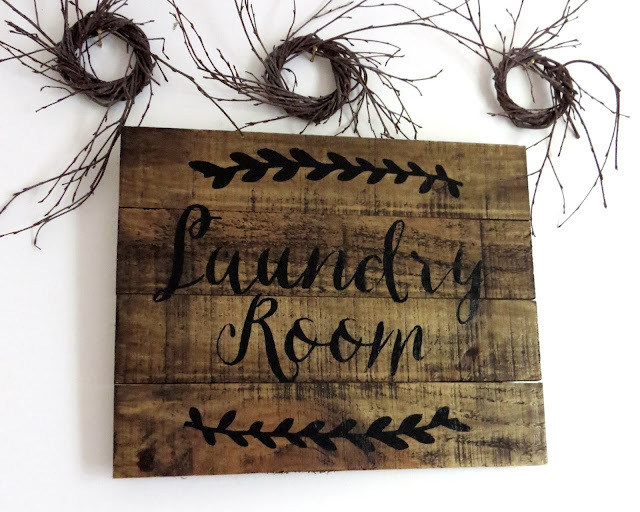 I will place a basket on the floor below the dryer and simply fold the laundry directly from the dryer into the basket, or fill the basket and fold the clothes on the dining room table. This is something I have always done, even when I had 3 little ones. 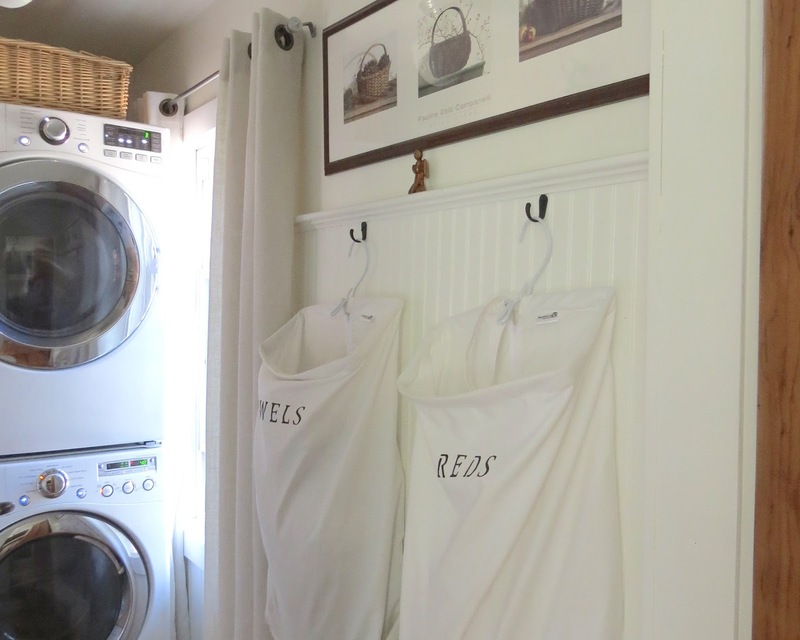 It takes only 5 minutes to fold a load instead of having baskets of wrinkled laundry piling up. We came up with a great solution for the piles of laundry that were sometimes sorted on the floor. I found these laundry bags on Walmart.com and ordered 4. I stenciled the words with a fabric pen and my husband hung the hooks. I LOVE this system for this small room. This sign is from Hobby Lobby. 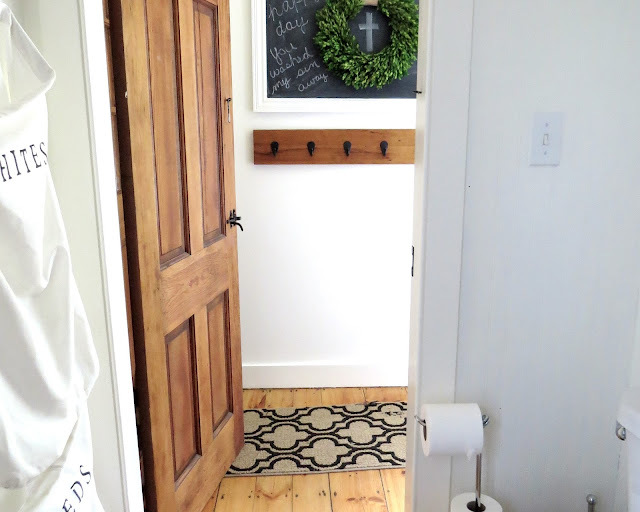 As you can imagine, it is very hard to keep a bathroom/laundry room clean. The dust from the dryer clings to the sink and toilet. I keep a thing of Clorox wipes under the sink for quick clean-ups. I found this picture at Goodwill and it fits perfectly in this space. The toilet paper holder is from Home Depot and it stores the extra toilet paper right on it which saves on storage space. 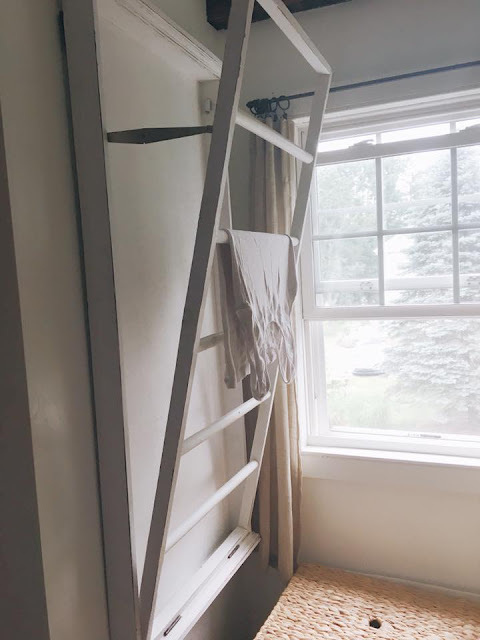 In the upstairs bathroom, we have a wooden rack which hangs on the wall. 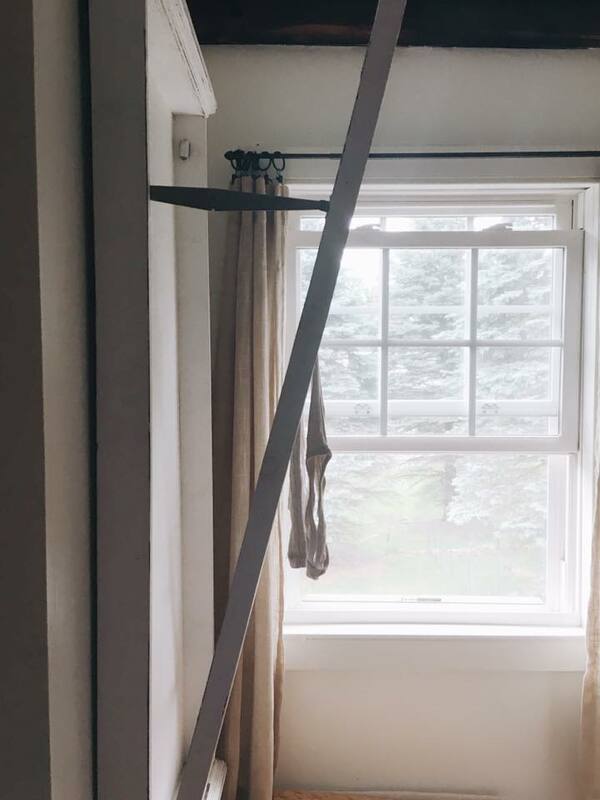 Here I hang undergarments and things that don't go in the dryer. We keep it upstairs for privacy. 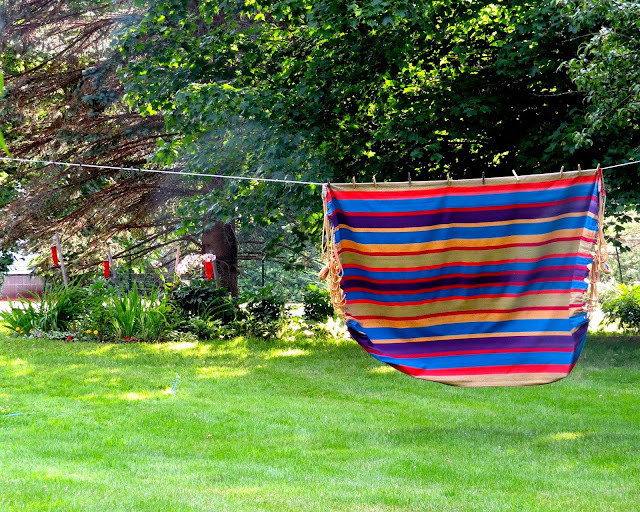 I also utilize an outside clothesline for things such as rugs, beach towels, and slipcovers. This is how we make a very small laundry room work for us. What are some of your solutions? Once again, I'm impressed! Thank you for sharing where you got the laundry bags. I'll be sure to check it out! My laundry room is in the dungeon. I don't think there is any hope for it. Your laundry room solutions are adorable! Excellent use of space.